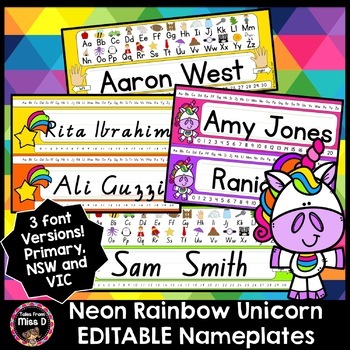 Brighten up your students' desks with these cute and colourful Editable Name Tags. Not only will these desk plates help students spell their name, it will also remind them of letters, sounds and numbers! There are 2 different designs in 6 different colours. I have used the font "KG Primary Penmanship", "NSW Foundation" and "Vic Modern Cursive". If you would like to use these fonts too you must have them on your computer. It is a free download. Alternatively, you can use any font you like.